Two brothers have committed fratricide (the act of killing one’s brother). One of them is buried stately [Eteocles]. The other one is deserted to become food for vultures and starved dogs [Polyneices]. A sister of the two brothers [Antigone] refuses to obey, and secretly buries her abandoned brother. To defy king Creon’s decision equals death sentence, but what happens after death is as important as what happens before. Without an accurate burial ceremony, no dignified place in the underworld. Sophocles’ play from around 442 BC is usually considered to be a drama about the religiousness of Antigone and the significance of an appropriate funeral. And about the risk of acting so uncompromisingly that one causes devastation. Historian Mary Beard mentions this interpretation in her book Women and Power from 2018. Antigone stirs things up, she seizes power illegally. She is disloyal to the collective, the regent Creon, the city of Thebe and its laws. Antigone creates a mess. Look what happens when one defies power! Many have, like Beard, taken issue with such a reading. Whose wilfulness and arrogance is this drama about? Creon’s or Antigone’s? And, is not the foremost theme in the play sibling hatred, sibling love, and the sense of justice? Both brothers Eteocles and Polyneices killed, and died, obviously they ought to have tantamount burial ceremonies. Antigone is a righteous rebel who objects to Creon’s decree that takes away the dignity of Polyneices. Furthermore, the choir recounts that the people of Thebe is on her side, as is Haimon (her betrothed; the king’s son) and Tiresias (the prophet). Equally, no one is affected by the action of Antigone – rather, she is the saviour of the situation. In her book Three Guineas, Virginia Woolf depicts Antigone as the educated man’s unfairly poor sister. To Woolf, Sophocles’ tragedy is an example of how a literary work could have become propaganda but evades such a fate due to the complexity of the text. At the end of the play, we unexpectedly sympathize with the person who ordered the death penalty, king Creon. He has been transformed by catharsis and now realizes that his autocratic ruling has led to catastrophic consequences. But ought he regret something more than his hubris? In Antigone there are not only starving dogs, there is also a catch. However, to grasp this, one must start by reading two other plays; Sophocles’ Oedipus and Aeschylus’ Seven Against Thebe. The brothers of Antigone have agreed to take turns and reign one year at a time; Eteocles begins. When it is time for Polyneices to take over, Eteocles breaches the contract and refuses to step down. Polyneices mobilizes and departs for Thebe to make war with Eteocles. The brothers meet in duel and, as we know, the brothers are killed by each other. The play Seven Against Thebe enlarges the context of Antigone’s actions – as well as Creon’s overreaction. The play also sheds light upon the conflict between Creon and Antigone. Why is it of such an import to Creon that Polyneices is not given a dignified burial ceremony? And why is it so important that Antigone is punished with the greatest penalty because she attempted to bury her brother? Why is Creon so relentless? When the brothers died, one of them was king by agreement (Polyneices), and the other was still king, by his own opinion (Eteocles). One of the homicides was an attack to fulfil a contract, and the other was a defence to continue breaching a contract. Thus, the one who was buried as a king, was not the king. And the one who was left unburied, was in fact the king. When Antigone defends Polyneices by insisting on a dignified funeral, yes, a funeral of a king, she is, thus, defending the king. Or, put in another way, she is abiding by the law, while Creon is breaching the law. Interpreted in this way, Antigone revolves around standing by, until death, the act of arranging a regent’s funeral. But, more overlooked, also around who is and may become a statesman. The brothers’ agreement to take yearly turns in reigning is an actual loosening up of the monarchy, and Antigone is honouring the brother who was adhering to the new order. Her lines – and Creon’s – shows that she is conscious of her challenging of the power (the autocratic rule) and that her actions is a capability test verifying that she has the traits to shoulder a regent’s position. It is Antigone who is next in line to the throne after her brothers, not their uncle Creon. Did perhaps Antigone and Polyneices have in mind a scenario of a wider democratic struggle? 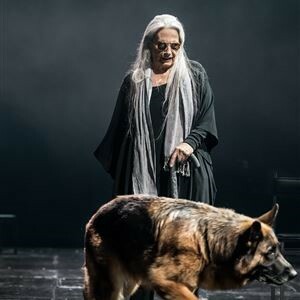 In the Swedish Royal Dramatic Theatre (Dramaten) staging of Antigone in 2017, the boy, who attends to the prophet the blind manwoman Tiresias, is played by a dog (non-starving). The dog is the uttermost witness, the visible and invisible actor, the one who is hidden away despite their significant contribution. It is the prophet and the dog who make the audience wince and hold their breath. Even when Antigone is lowered down to Hades, accompanied by Led Zeppelin music, she cannot rival the prophet’s and the dog’s timeless and wise personas. Tiresias and the dog are a hyperbole, a kind of drag-act reminding us of the ones who are visible yet become invisible. Women, older people, non-binary, functionally marginalized, migrants, workers, children, dogs, other non-humans go broadly unnoticed in the grandiose narratives of posterity. The prophet and the dog make-visible those excluded in the loosening of the autocratic rule that was the first formal European democracy. Antigone acts out a regent’s early and desperate revolt to democratize the scope of decision-making and law-making. She has the people, the choir, the prophets, and the audience with her. At last – but too late – perhaps even Creon.